What is the Sachs-Wolfe effect? Yesterday I talked about the CMB cold spot, and how it could be due to a lack of galaxies between us and the cosmic background. That’s because when galaxies are in the way of our view they can make the cosmic microwave background appear warmer than it actually is. On the face of it, that seems counter-intuitive. How can blocking some of the cosmic light make it appear warmer? It all has to do with the Sachs-Wolfe effect, or more specifically the integrated Sachs-Wolfe effect. The Sachs-Wolfe effect was first proposed in the late 1960s. The cosmic microwave background had just been discovered a few years earlier, and had been observed as a uniform thermal blackbody. In other words, the cosmic background appeared to have a uniform temperature of about 3 Kelvin in all directions. At the time the detectors weren’t sensitive enough to see whether there were small fluctuations in the CMB, but Sachs and Wolfe predicted that there should be. They argued that variations in density in the early universe would make some regions appear slightly cooler and others slightly warmer due to gravitational lensing. Basically, light from a region than is more dense would have to climb out of a deeper gravitational hole, and would be slightly redshifted as a result. Light from a less dense region would have less gravity to deal with, and thus appear slightly blueshifted. Since the wavelengths of the cosmic background is a measure of its temperature, the background would appear to have small fluctuations in temperature. When the COBE satellite observed the CMB in the early 1990s, it saw fluctuations on exactly the scale predicted by Sachs and Wolfe. Since then we’ve observed even smaller fluctuations in the CMB, and that means we can observe more subtle effects, including a variation on Sachs-Wolfe known as the integrated Sachs-Wolfe. This also produces a fluctuation in the CMB, but with an interesting twist. To see how it works, imagine light from the cosmic microwave background on its way toward us. Along its journey, it enters a region of space where there is a galactic supercluster. The gravity of all those galaxies creates a gravity well. As the cosmic light enters the region, the gravity causes it to be blueshifted as it gains energy. On the way out of the region it has to climb out of the gravity well, so it gets redshifted. All things being equal, the two would cancel out. But the universe is expanding, and as a result the supercluster becomes less dense during the time the light travels through it. This means when the light climbs out of the gravity well it loses a bit less energy than it gained entering the well. Because of cosmic expansion the cosmic light has gotten a bit of energy. It therefore appears slightly warmer than it would otherwise. Thus the expansion of the universe and the gravity of the supercluster combine to make that region of the CMB appear slightly warmer. A void would work in reverse. The light would be redshifted entering the void due the the gravitational pull of galaxies outside the void, and blueshifted as it leaves the void. 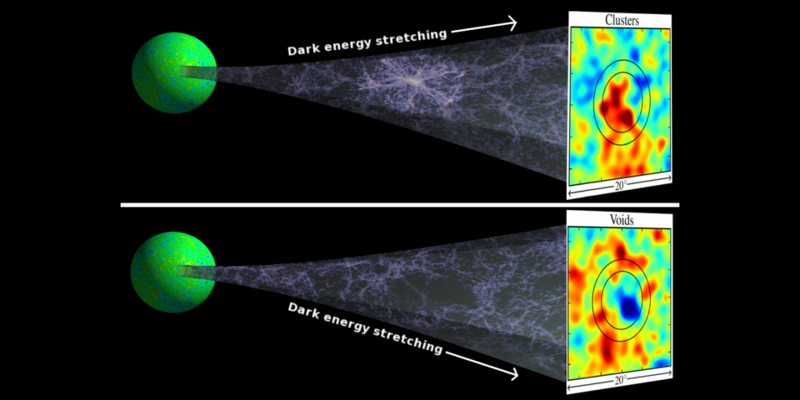 The expansion of the universe would mean a net loss of energy for the light, and therefore it would appear cooler. This is exactly what we see with the CMB cold spot. What’s interesting about the integrated Sachs-Wolfe effect is that it’s one of the more subtle ways that we know the universe really is expanding. What I don’t understand is how thermal radiation from matter, ie, galaxies and superclusters, does not add to the CMB. When looking at very small perturbations in the CMB how is this taken into account? I have personally measured the temperature of the moon by measuring the microwave noise emitted and would expect anything that is above 0 degrees K to add to the CMB? They add to what we observe, and are known as the foreground effect. When we measure the CMB we subtract the foreground effects to get the actual CMB. There are ways we can tel the difference, such as the type of spectrum we observe. Where can I learn more about this? I would like to understand how matter at 2.7K can be distinguished from the CMB which looks like blackbody radiation at the same temperature? I’m missing something. There should be no difference on a redshift scale between the temperature of the CMB (or its “CHROMINANCE”) if the photons are passing through a super void because, what counts only is the difference between the grave potential (equal to c^2) of the CMB at the point of emission (very low 13 billions years ago) versus its potential at the point of arrival on earth (grave potential much higher now), whatever the path followed by the photons and whatever the universe rate of expansion in between both events. But there will be a change in the number of CMB photons per unit of time and per unit of surface coming from a specific direction because super void will act as anti-lensing structure thus leading to the hereof decrease of photons, hence decrease of the CMB “LUMINANCE”. The effect of super voids on luminance is very sensitive : the larger the super void, the lower the luminance. Ups and lows in the potential structure of the universe will act just like up and lows at the water surface of a swimming pool causing to unevenly lighten the floor of the swimming pool. That is just what the CMB looks like by now.